I had previous reason to admire Axel Kober’s conducting in the Leipzig Opera’s marvellous triple-bill of Schoenberg’s one-act operas, Moderne Menschen. Arguably every bit as great a challenge, Die Frau ohne Schatten proved just as successful under Kober’s baton. Well shaped and with a clear sense of the structure, this was a reading which, if it did not quite match the sensational account I heard a good few years ago from Christoph von Donhányi at Covent Garden, had nothing to fear from most recorded competition, and was certainly superior to Gustav Kuhn in Paris. There were a few shaky moments, especially during the first ten minutes or so, when it sounded as though the orchestra was settling down, and occasionally afterwards from the brass. On the whole, however, the Orchestra of the Deutsche Oper proved fully equal to Strauss’s demands. The sheen of its strings, sometimes more Viennese, sometimes darker – rather like Strauss’s score, one might say – and the character of its woodwind section were especially worthy of mention. Whatever Strauss’s notorious criticisms of Schoenberg’s Op.16 Orchestral Pieces, they did not sound so very far away. For, poised between the previous sound-worlds of Elektra and Rosenkavalier, with something of the Alpine Symphony about it, and possessed of a magical, fantastical expressionism very much of its own, one of Strauss’s most truly extraordinary scores was truly able to resound. If the grinding dissonances immediately prior to the final resolution were not nailed in quite the way one hears on Christian Thielemann’s Vienna recording of the orchestral fantasy, I have never heard anyone else, even Karl Böhm, achieve that – and a purely orchestral performance is a different matter in any case. This was a distinguished musical account. The singing, however, was considerably more variable. Robert Brubaker’s Emperor improved as time went on, though his tendency to sharpness and indeed to shouting was never quite surmounted. Strauss wrote a cruel part, but there it is. Brubaker, however, was vastly preferable to Eva Johansson as the Dyer’s Wife. Awkward on stage, she managed the right notes from time to time, the right vowels even less so. She also exhibited a curious tendency – certainly more curious in her part than his – simply to stand and shout. Manuela Uhl occasionally struggled as the Empress, but an announcement had been made concerning her indisposition; in any case, she more often proved perfectly equal to the composer’s demands. Given the circumstances, this was a creditable assumption. Jane Henschel was predictably fine as the Nurse – what a wonderful, ambiguous role this is – but such excellence should not be taken for granted. Strange links with the spirit world were very much in evidence in her portrayal. 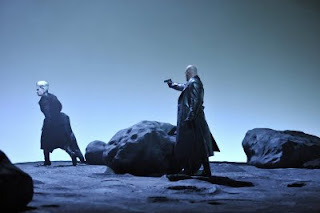 Johan Reuter’s fine form as Barak might also have been expected, but again, remains equally worthy of praise. Carefully observant of words and music, he penetrated to the lovable heart of the dyer’s character. Intendant Kirsten Harms’s production did not seem quite to add up. There was nothing especially wrong with it, and Bernd Damovsky’s stage designs were often rather striking, but I am not sure that someone relatively unfamiliar with what can sometimes seem a rather baffling drama would have found a way in here. Robert Wilson in Paris could perhaps be judged to have over-simplified Hofmannsthal’s layers of symbolism, though I rather enjoyed that production. Taking more of a ‘line’, almost any line (within reason), might not have been a bad idea in this case, though. The work benefits from a degree at least of help. Still, there was a great deal to savour from the conductor, orchestra, and much of the singing. Die Frau may have its flaws, but there are sections as great as anything Strauss wrote, music that was here largely heard to considerable advantage.